A federal grand jury on Aug. 5 indicted former Los Angeles County Sheriff Lee Baca on federal charges alleging that he conspired to obstruct justice, obstructed justice, and lied to the federal government. The case against Baca is the result of an investigation by the FBI, and is one in a series of cases resulting from an investigation into corruption and civil rights abuses at county jail facilities in Downtown Los Angeles. 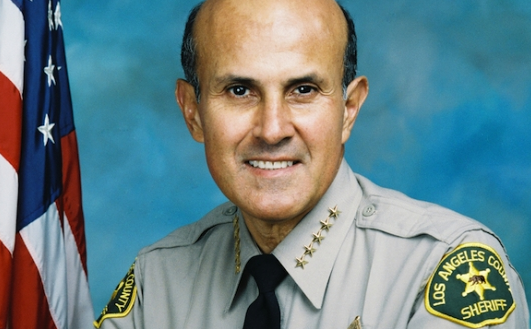 Lee Baca resigned as sheriff in 2014. As a result of the investigation, 20 current or former members of the Los Angeles County Sheriff’s Department were convicted of federal charges, including former Undersheriff Paul Tanaka, who was sentenced to five years in prison for obstructing a federal investigation of abuse of inmates in county jails. Tanaka is free pending appeal before the 9th Circuit and is due to report to prison on Oct. 3. He stepped down as mayor of Gardena when he was sentenced in June and was originally scheduled to begin serving his time on Aug. 1. Throughout Tanaka’s trial, the defense maintained that Baca was largely responsible for the corruption and unsuccessfully requested that he be brought in to testify. Baca, 74, of San Marino was charged in a three-count superseding indictment, with one count of conspiracy to obstruct a federal grand jury investigation, one count of obstruction of justice, and one count of making false statements. The conspiracy charge carries a maximum term of five years in prison, the obstruction of justice carries a maximum term of 10 years in prison, and the charge of making a false statement carries a maximum term of five years in prison. If convicted on all counts, the maximum Baca faces is 20 years in federal prison. Baca is expected to be arraigned on the superseding indictment at a later date in U.S. District Court in Los Angeles. On Aug. 1, Baca backed out of a plea deal under which he would serve no more than six months behind bars on a single count of lying to the FBI. U.S. District Judge Percy Anderson rejected the agreement, saying it was too lenient. Rather than face a penalty of more than five years, Baca withdrew his guilty plea, opening himself up to a more wide-ranging indictment. George Hofstetter, president of the Association for Los Angeles Deputy Sheriffs, said, “Baca knew what was going on, and he perpetuated and encouraged the culture. When confronted with the mess he had created, Baca blamed his subordinates instead of taking responsibility as a leader should.